How is Japan Supposed to Grow GDP With a Declining Population? Now that the Nikkei is up 45% year to date, people seem to be becoming increasingly excited about Japan’s economy. Leaving aside for the moment the portion of the advance that is a pure monetary illusion, the Nikkei has risen more than the Yen has depreciated, which implies that buyers are expecting a real improvement in the Japanese economy. Without a more granular analysis of the underlying components of the Nikkei, it’s difficult to assess what exact scenario Japanese equities are now pricing in, but to the extent that they are pricing in Real GDP growth, investors should tread with caution. That’s because no matter how much money the Japanese government prints, it can’t print people, and the true root cause of Japan’s stagnant GDP is it’s declining population. As I’ve written before, Japan’s lost decades are as much fiction as fact because Japan’s GDP per capita has not performed nearly as poorly as its overall GDP. There are only two ways to grow GDP: productivity growth and population growth. By mathematical necessity a nation with a declining population must improve its productivity at a materially faster rate than other nations if it wishes to increase its GDP at the same rate as nations with growing populations. Japan’s population is declining, and as shown in the chart below, Japan’s GDP per capita is already quite high compared to its global peers (especially considering it is an island nation with limited natural resources). This implies that Japan does not have a large productivity “gap” to fill relative to other nations, and since it does not have access to significantly better technology than the rest of the world, it is nearly impossible to believe that the country can achieve materially higher productivity growth. Declining population and normal productivity growth means that GDP growth is going to be hard to come by. 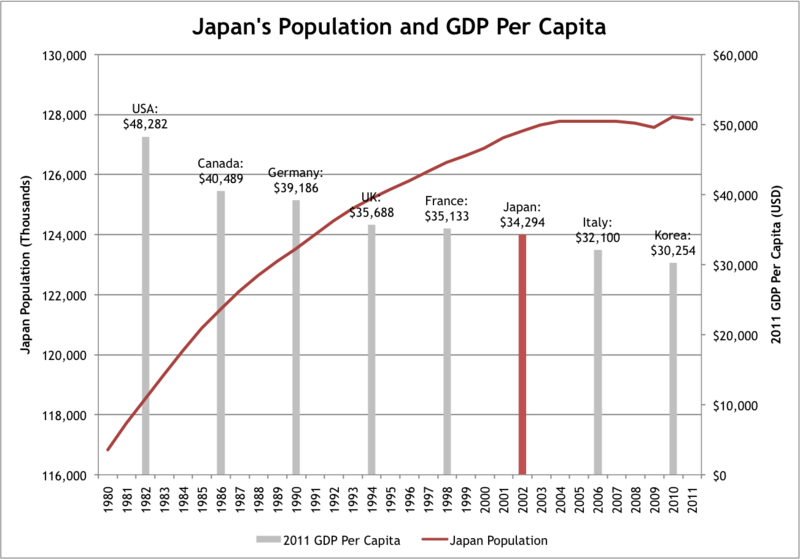 For Japan and all countries GDP should not be the focus, GDP per capita should be. Economic policies that attempt to grow real GDP, but do not address Japan’s population decline are unlikely to lead to real economic growth. Further, policies that attempt to achieve this growth by borrowing money in a shrinking society are risking calamity.